These little heart shaped beads in pale pink were so sweet I wanted to make something simple and special with them to really show off their shape and presence. I decided to use them in a pretty little handmade beaded charm that could be worn as a necklace or attached to a fastener to be used as a purse charm, keyring or zipper pull. I love when things are versatile enough to be used however you want to use them. 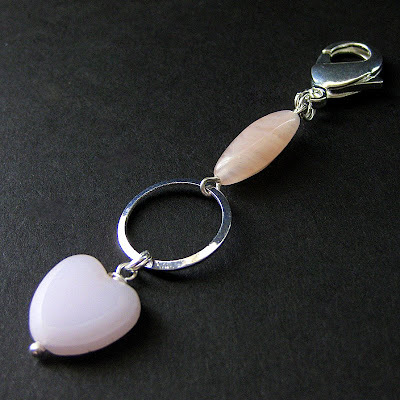 Made with a soft pink glass heart at the end accompanied with a seamless silver ring and another sweet pink bead, this heart shaped charm carries a great amount of versatility and a romantic and sweet style.